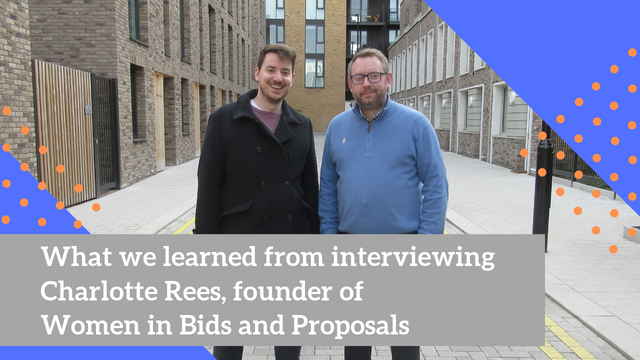 In episode two of The Red Review podcast, my co-host Jeremy Brim and I got the chance to interview Charlotte Rees, the founder of Women in Bids and Proposals. We started the podcast to give us a chance to meet interesting people working across the business development lifecycle, and it was lovely to have Charlotte as our first every guest. Women in Bids and Proposals (WiBAP) is a not for profit organisation set up to champion diversity within the bids and proposals profession. Anyone can join for free as an affiliate, over 750 people already have! WiBAP runs networking events across the UK (I didn't realise it's a national organisation with branches across England) and in March this year they ran their first full-day conference, titled "Make it Happen". Jeremy's businesses was a sponsor and he also ran one of the main sessions, giving a talk on career development in the bids and proposals profession. As Charlotte's first conference, she had some great learning points, useful for anyone who might be thinking about setting up an event, conference or even an internal workshop with their team. Let your audience design the conference - Charlotte took feedback from the WiBAP community to shape the conference, choosing topics which aligned to what her audience has asked for. Sponsors and speakers were then aligned to those topics, rather than letting sponsors choose their own topics. Get a great team around you - Charlotte has brought together a group of like-minded people who help her to put on events like this. WiBAP is a not for profit and is supported by volunteers, so to put on a conference it takes a lot of extra time outside of work to get things right. Put time into the little details to make the event feel unique - From putting on a bus from the station so delegates could extend their networking time, to designing the right ice breaker to get the audience buzzing, it was the little extras that have made the conference stand out. To hear the full episode, click the link below! Our first interview, so let's hope it's not a complete car crash!